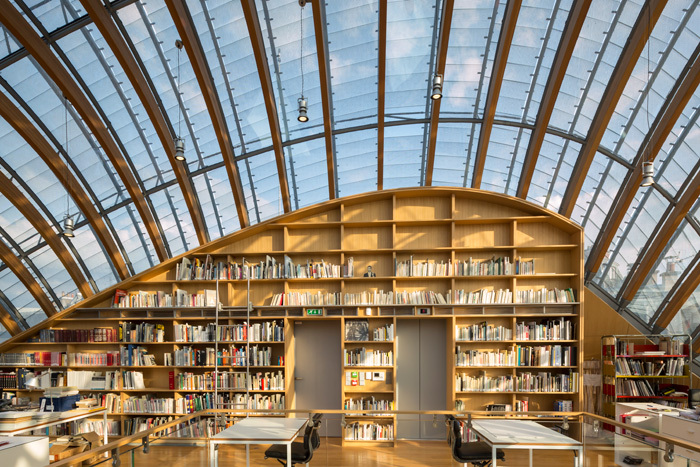 Renzo Piano has inserted a radical aluminium-clad six-storey structure directly into the historic urban fabric of Paris, but it remains virtually invisible from the street. 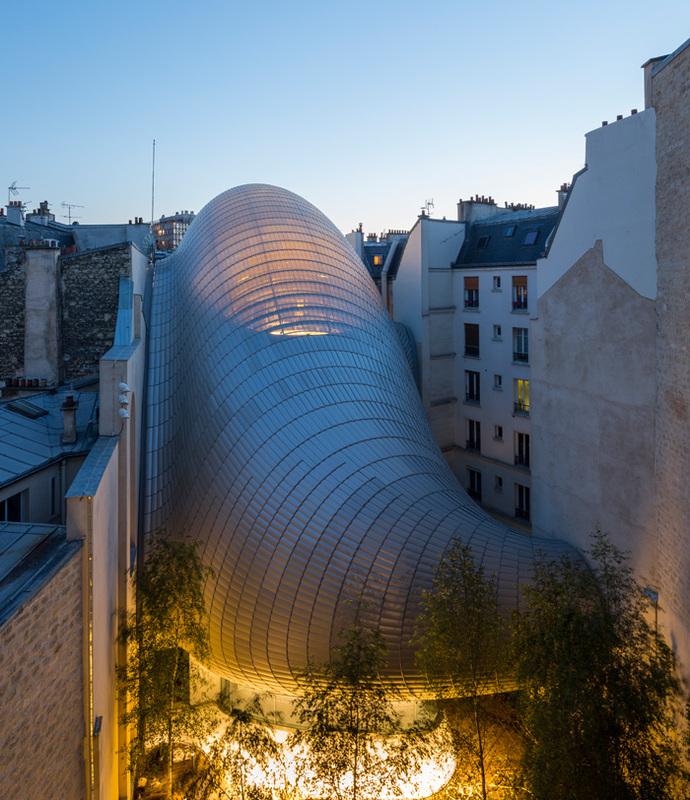 Piano himself admits that the Fondation Pathé ‘looks like a little animal actually trying to go up and breathe fresh air’. 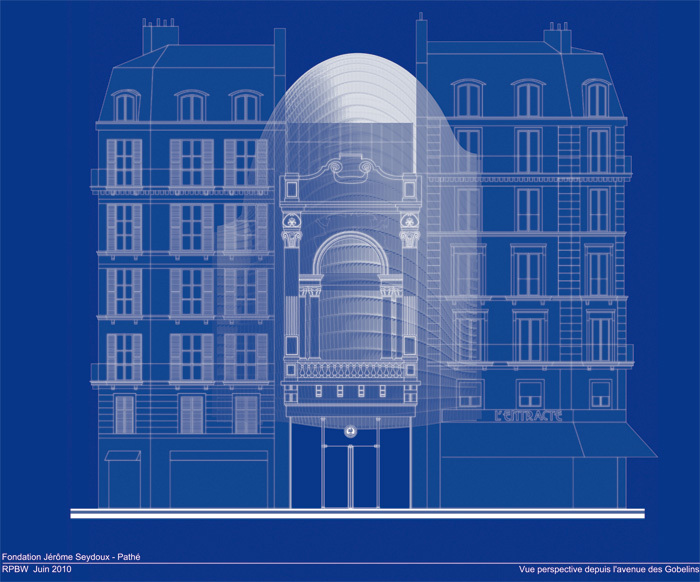 The project started in 2006, when the Fondation was established to preserve and promote the Pathé heritage. Pathé is known for the newsreels it invented in 1908, but was much more. Founded in 1896, it was a global business empire within a decade, dominant in film equipment and production, and a major cinema chain. Its fortunes later waxed and waned, and it came into Jérôme Seydoux's business interests in 1990. With his wife Sophie, he brought Piano to look at a site for the foundation of which she is president. It was a derelict cinema on the Avenue des Gobelins in the 13th arrondissement. The avenue was cut through the city in the mid-19th century and is lined with typically solid Parisian buildings. 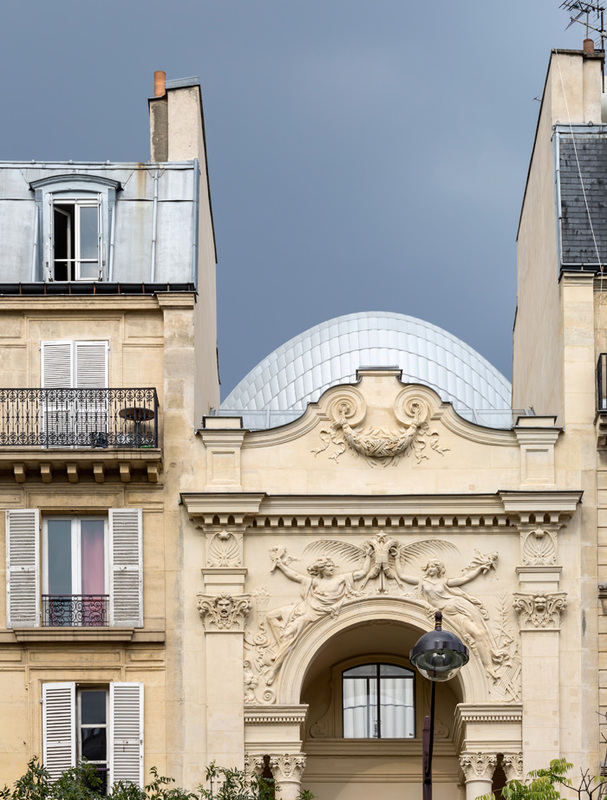 But not far from the Place d'Italie, a gap in the standard seven-storey stone frontage is spanned by an 1869 cream neoclassical facade by Alphonse Cusin, with a grand balcony and semi-circular arch. Scantily robed relief figures of a male Drama and female Comedy lounge on the arch, beneath a cornice -- these are early works by Auguste Rodin, sculpted when he was an unknown student. It was the entrance to the 800-capacity Théâtre des Gobelins, which pioneered cinema in its programme from 1906, showing documentaries as well as feature films. In 1934, it became the Rodin Cinema, which was gutted and extended in 1969 and restored in 1993. Closing 10 years later, the building was demolished in 2010. Occupying space in an inner courtyard, a new building would never have been permitted had the theatre not been there originally. But look up, and the underside of a dramatic solid structure looms immediately above. A little like a warped Zeppelin, it has a silvery grey bulk, but up close the skin has near-vertical, parallel rows of individual, horizontal panels. These are some of the Fondation's 7000 anodised aluminium, perforated lamellas, each costing about €10 and every one slightly different in shape and orientation according to their position on the curved surface. They are 25cm across, and between 40cm to 1m long, and give the whole surface a rhythm. Here, they clad the insulated concrete shell of the mid-floors. There's a narrow gap between the new structure and the old buildings on one side, which it touches with three organic protrusions from one flank of its body. The old walls are marked with ghost outlines left where the previous cinema building touched them. The demolished structure's area set the maximum that could be built new, however, the previous footprint was bigger. Piano wanted to bring more light down into the courtyard, lifting the neighbours' back windows out of a century of shadow and enabling a garden to be built. That required a smaller footprint, so, squeezing in the same square metres would, by 'force of necessity', require a taller volume. And, with neighbours and historic fabric all around, the final form would also need to satisfy a host of legal requirements. Before ascending into the building, let us walk across terrazzo through the gently sloping ground floor into that garden. Here, birch trees grow, already almost halfway to their eventual 20m height. They are reaching towards the light that falls into the deep well made by the surrounding old buildings. This is a tranquil space. 'I love the idea of creating a space of silence and contemplation in amongst big traffic and big noise,' comments Piano. A long, new, stone bench faces the tail of the Fondation volume, which is sectioned abruptly as it interfaces with the neighbouring wall. Behind the bench, up a few stairs, a fire exit passage leads through a property to a side street, rue Primatrice. Inside the new building, set flush to a neighbouring blind wall along one side, is a concrete service core in which the stairs (one flight yellow, the other red) and lifts (red inside) are contained. 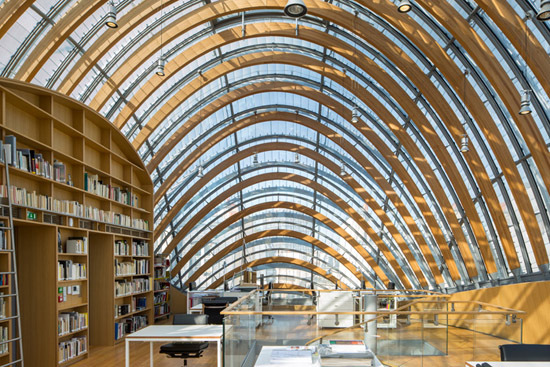 Emerging on the fifth floor, you step out at the level of the surrounding roofs, flooded with light falling through the 360-degree transparent bubble dome. Inside it, great structural ribs of larch -- a soft wood that can bend -- arc in parallel from one side to the other. 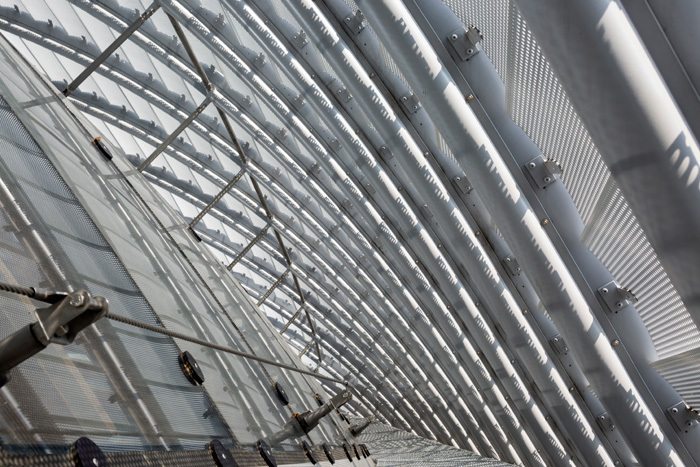 They are braced by a steel frame that holds double, curved-glass panes. This is the inner side of a double skin -- beyond it, the bubble is entirely encased in those aluminium lamellas. They act as a field of brise soleil, without which the upper floors would be pure greenhouse, but they are perforated. 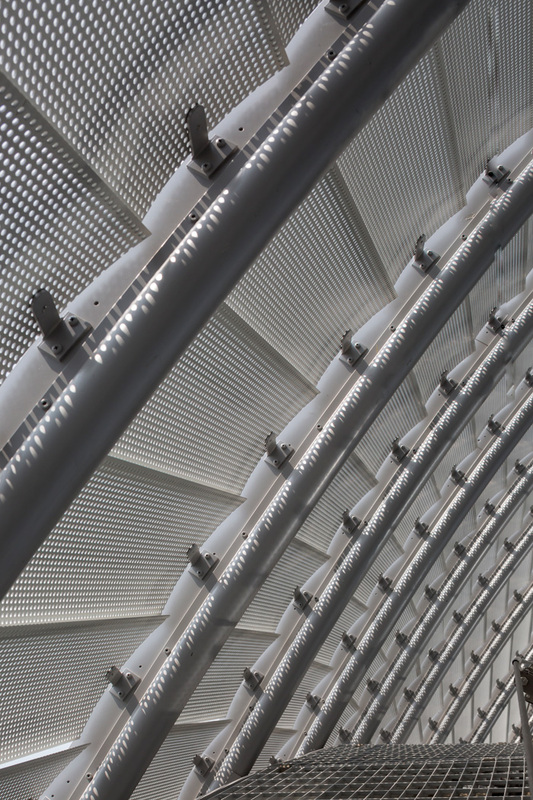 The area of perforation was modelled for best balance between protection and transparency, reaching a maximum of 50 per cent around the floor, but down to 30 per cent at the dome's 25m-high apex, the same as the lamellas cladding the concrete shell below. Ventilation is natural and there are three skylight openings. 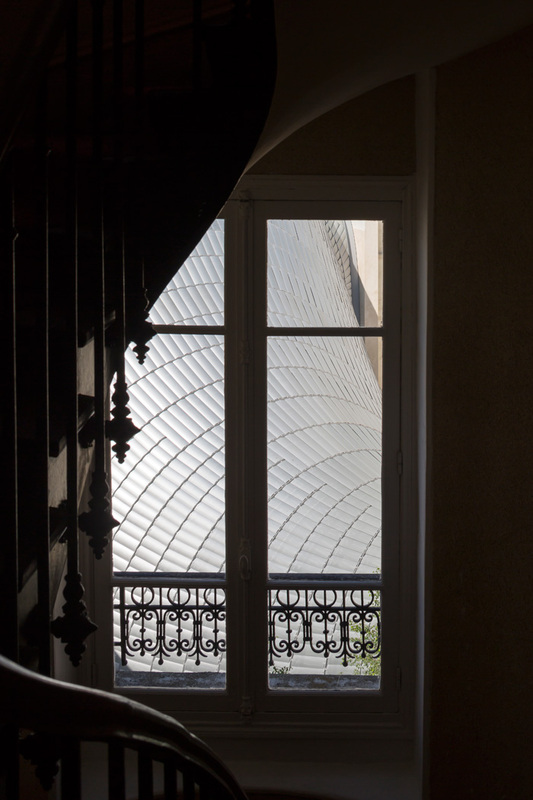 The top floor is an open platform for the Fondation's researchers. They have a wall of bookcasing that follows the curve of the dome above. It's not just books that go in and out of it -- the lift and stairs are accessed there, too. Thorsten Sahlmann, associate at Piano's practice RPBW and architect in charge, personally designed the minimalist library ladder on wheels that runs along the bookcase. 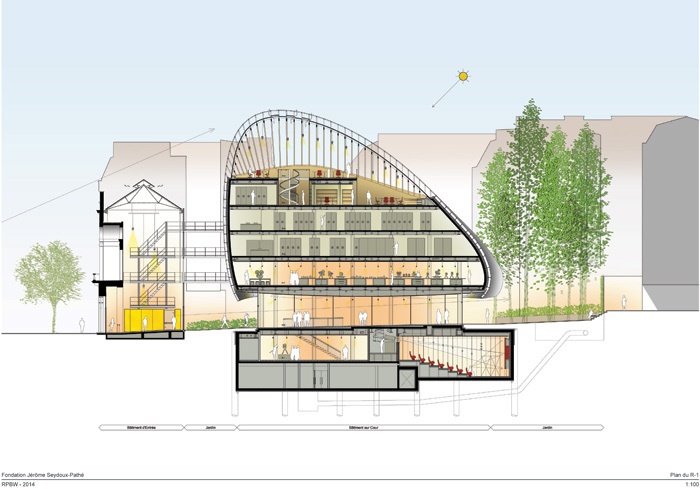 At the end, above the garden, the dome plunges down to the floor below and sweeps around a circular boardroom table. It creates a dynamic sense of movement as if one was in the control room of a starship thrust into Paris. The bookcase curves gracefully down a whole floor beside it, from beyond the fifth-floor's edge. A spiral staircase descends to this level from the research floor, and beneath it are tucked three offices and a small kitchen. The third and second floors are within the 22cm-thick concrete shell. Here, in the belly of the beast, is what Piano calls 'the treasure house'. Pathé's paper archives are kept at a steady 19ºC and 50 per cent humidity. The volatile celluloid (it can spontaneously combust) is stored outside Paris in a bunker. Steel floor beams strengthen the concrete decks, supported on columns that can take loads of 1.3 tonnes per square metre. 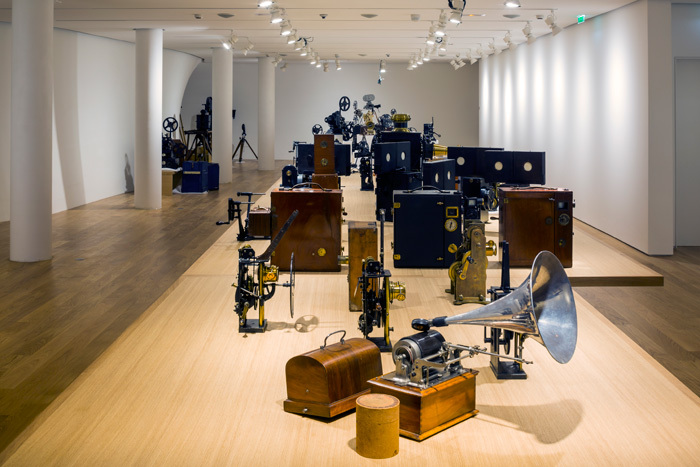 The first floor is exhibition space, accommodating a fantastic permanent collection of projectors and cameras dating from around 1900 to the Seventies. Most sit on a 20m-long table, but some are mounted on the floor, even in the nook of the tail's interior that curls off the room. Exhibition space continues in the basement, but this is where the building delivers what Pathé was always about -- the moving pictures themselves. A 66-seat cinema will screen Pathé's archive, including silent films originally accompanied by piano. To the left of the screen is an alcove where a C Bechstein upright lurks. 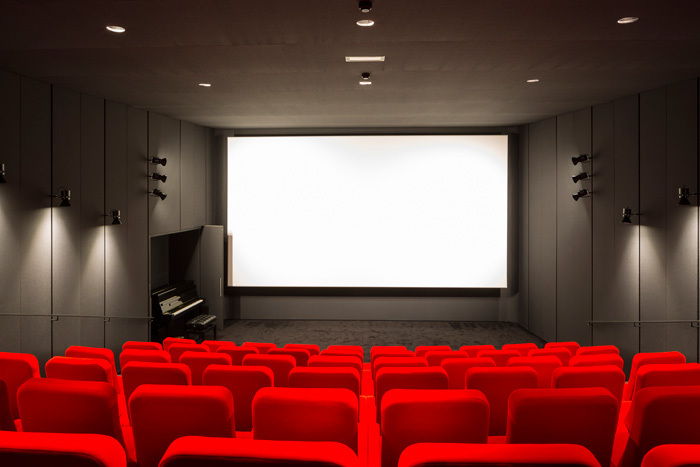 The normal high- acoustic absorbency of cinemas would make a piano sound dead, while a traditional music hall is too echoey, so an acoustic compromise was found between the two. Soundtracks can also be played -- with speakers concealed in the black walls, which make the contemporary red seats stand out all the more. What's missing is a bar or cafe, but Sophie Seydoux decided against this -- there is a brasserie next door. Below the basement space, is a plant level, which includes air intake from the garden, and connection into the city's district heating system. 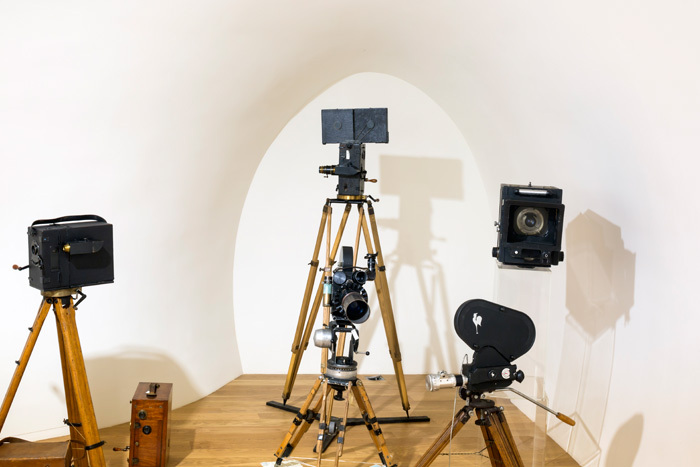 By coincidence, the other RPBW project connected with film, and currently in the pipeline, shares characteristics with the Fondation Pathé. The new Motion Picture Academy in Los Angeles takes a curved form (more spherical) and spectacularly places a platform under a transparent dome at its top. It, too is connected to an older building -- in this case, the refurbished 1939 Wilshire-May building by Albert C Martin. Piano modestly summarises that, 'Pathé is small and meaningful, and it's a public space.' 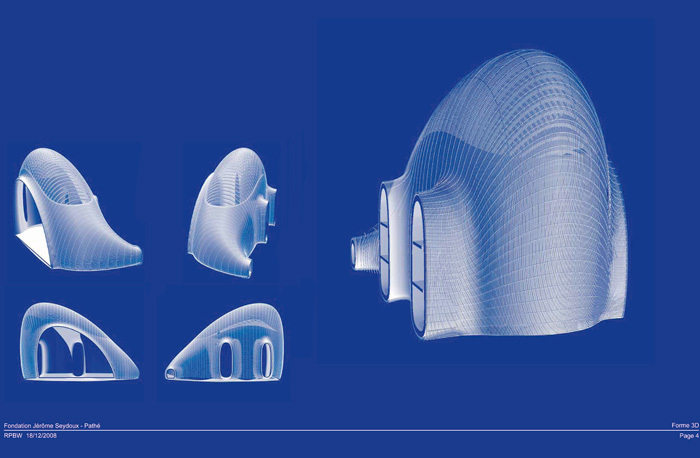 It also pushes parametric design, structural material and surface technology. The extraordinary form is something that hasn't been done before. It may explore similar architectonic territory to Peter Cook and Colin Fournier in the more extrovert and exposed 'Friendly Alien' Kunsthaus Graz (2003), but the Fondation doesn't shout at all. Paris has plenty of showy architecture in its 'grands projets', but since the Eiffel Tower created outrage and enchantment in 1889, how many others have delivered a real shock of the new? Not many. Certainly, the Centre Pompidou, in which Piano and Richard Rogers unleashed their high-tech vision on the world stage in 1977, was a provocation. Piano's big 'little animal', too provokes a shock of the new in a historical context, but it hardly shows itself at all. Which is precisely part of the beauty of the beast.